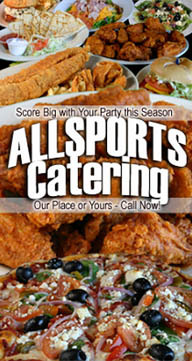 AllSports Cafe | Where the object is to score…Great Food! Welcome to Allsports Cafe’ ! We are the Valley’s Favorite Bar & Grill where you can enjoy award winning food, watch the big game, and see live music! Looking for the best buffalo hot wings in Roanoke and Salem? We have them right here. We have multiple hi-def and large screen TVs, Karaoke and offer smoking and non-smoking dining. We take great pride in providing you with personalized customer service and satisfaction.